Our company also install shade houses in Kenya and the whole of east Africa. Shade houses are wooden, plastic or metallic frame covered with shade nets of different shading depending on the environment and sun intensity. In Kenya shade houses are used to produce vegetables like kale's, tomatoes, straw berries, spinach e.t.c in hot areas. 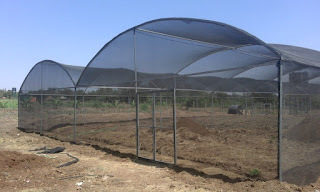 Shade net used are u.v treated and can last for a period of 4-6 years depending on the climatic factor of the region. Our company has installed several shade houses in Kenya, Tanzania, Uganda and Rwanda. Shade houses comes in different colors and sizes. We stock 4 meters width by 100 meters and we can cut to sizes required by our clients. Hortitechno produce is one of the best shade house makers and suppliers of shade net in Kenya.